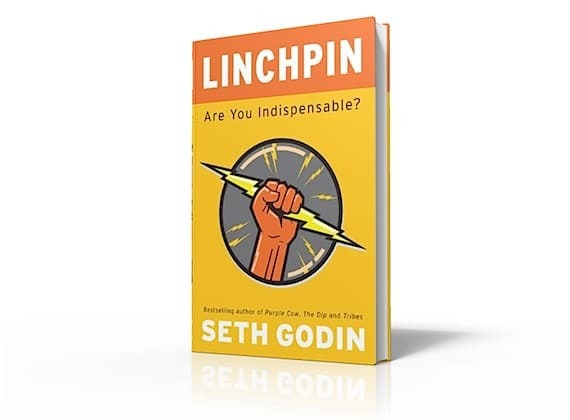 Recently, I had the opportunity to read an “advance readers copy” (ARC) of Seth Godin’s new book, Linchpin: Are You Indispensable? Admittedly, I am a fan. I have read most of Seth’s books. However, this is my favorite so far. In fact, I would go so far as to say this is the most important book I have read in the last year. In a minute, I will tell you how to get a free copy. Seth’s previous books have been about creating infectious ideas, developing remarkable products, and building engaged tribes. However, this is a book about becoming an indispensable person. But to do that, you have to be willing to let go of your average life and be willing to become extraordinary. In this book, Seth explains how. Recently, I had the privilege of interviewing Seth about his new book. My questions are in bold. His answers will give you a little sample of what you can expect in the book. Also, you can read more interviews and blogs posts about the book here. Q: You begin the book by explaining the “take-care-of-you bargain” that corporations have cut with their workers. Can you explain this bargain and why it is no longer working? The deal says, “do what I say and I will pay you, give you benefits and even a comfortable retirement.” It’s only been two hundred years or so that there’s been a deal like this. Before that, you farmed or you hunted, but no one showed up and said, “you work for me.” Perhaps priests and army officers had a similar deal, but that was mostly it. So that’s what we grew up with. Go to school and do what you’re told. Apply for a job in the placement office. Have a resume like everyone else’s. Go to work and follow the manual, ask for instructions, do what you’re told. This was a great deal if it made you happy. There was a productive “machine” (whether it was an assembly line, a Subway franchise or a big book publisher, it was still a machine) and your job was to feed it, maintain it, and make it a little more productive. So companies looked around and said, “why do we need all these replaceable people who merely do what they’re told and get paid a lot!” Layoffs ensue. Pain follows. Q: Okay, so the bargain no longer really works. The alternative, you say, is to become a “linchpin.” What exactly is a linchpin? The linchpin is the person who takes an alternative path, who declined the take-care-of-you-bargain. The linchpin insists on making a difference, on leading, on connecting with others and doing something I call art. The linchpin is the indispensable one, the one the company can’t live without. This is about humanity, not compliance. Q: You say that workers have been “commoditized”? Can you explain what you mean and then elaborate on how this creates an opportunity? Interchangeable parts, Henry Ford’s key bit of leverage, leads to interchangeable people. Think of how much power you get as the boss if you can tell any employee to pound sand at any time. If you’re an employee, this is frightening, until you realize that there are jobs that can’t be in a manual, and people who aren’t so interchangeable. The opportunity is in rejecting this deal, doing the work that can’t be done by manual followers. Q: In The Purple Cow you used a memorable metaphor to describe remarkable products. How are Purple Cows and “Linchpins” related? Linchpin is Purple Cow for people. Someone worth talking about, someone worth crossing the street to say hello to, someone who refuses to be an interchangeable cog in a vast machine. This isn’t easy to do, which is precisely why it’s worth so much. Q: Okay, but how do linchpins think differently than everyone else? For me, the key postural difference is this: cogs see a job, linchpins see a platform. Every interaction, every assignment is a chance to make a change, a chance to delight or surprise or to touch someone. Once you see the platform and the opportunity, it really does change things. Q: Wow. That is subtle—but huge. How does education fit into all of this? More specifically, how does education actually work against creating linchpins? Michael, you and I both know where school came from. It came from industrialists and governments in search of compliant cogs. There was a shortage and so society invested in making more. More factory workers, more ordinary folks doing ordinary jobs. Placidly. The #2 pencil, the SAT, and the report card were invented by people in search of factory workers. Q: My guess is that this interview, though intriguing, is starting to make some of my readers uncomfortable, perhaps even fearful. How do linchpins deal with fear? Fear is a tricky word. Good fear, fear of falling off a building or eating fire, that fear isn’t there to be dealt with. I’m glad I’m afraid of slipping on the ice. If I wasn’t, I’d be in a full body cast. Fake fear, though, fear of being laughed at, fear of making a mistake, fear of not fitting in… that fear needs to be thrown out the window. Steven Pressfield calls it the resistance, and it comes from your lizard brain, the prehistoric lump near your brain stem that still fears snakes and saber tooth tigers. Fear for a linchpin is a clue that you’re getting close to doing something important. Q: I like that … seeing it as a clue. You also talk about the pursuit of perfection and contrast that with art. How are they different and why does it matter? Can you name a perfect artist? Anyone who has simultaneously made change and not made a mistake? Impossible. “Perfect” is error-free. That’s not the goal, because others can whittle away at that with more diligence than you, and once they get there, they aren’t adequately rewarded. No, the win is in creating connection and community and in moving people and the cause forward. Q: Got it. Surprisingly—at least in this environment where so many are looking for work—you say that linchpins don’t need resumes. You argue that they can actually work against them. How so? The resume is your ticket to being ignored. The resume demands compliance. Compliant layout, compliant experience. It levels the playing field, to your detriment. Q: So this brings us to the concept of “emotional labor.” Why is it so important? The work of digging a ditch or hauling bricks is labor. Physical labor. That’s not what most of us get paid to do. We do emotional labor. Work that involves our head, our emotions, our personality … and yet we whine all the time, whine that we don’t feel like it, that we’re not inspired, that we can’t make it work. Michael, a lot of your readers are writers as well. And this might be the book’s most important lesson of all. Our job is to make change. Our job is to connect to people, to interact with them in a way that leaves them better than we found them, more able to get where they’d like to go. Every time we waste that opportunity, every page or sentence that doesn’t do enough to advance the cause is a waste. We won’t often get the platform we need to touch someone. When the opportunity arises, we have to take it, embrace it and push it where it has never been before. To do anything else is a shame. Q: Thank you, Seth. I know we have only scratched the surface, but I hope it is enough to get people to buy this book and read it. I know it will prove life-changing for them. Just to prove how valuable I think this book is, I am recommending it to you despite the fact that it was not published by Thomas Nelson. It was published by Portfolio Books, an imprint of Penguin. They have graciously made 100 copies of Linchpin available to my readers. In addition, Seth has given me 12 additional, autographed copies to give away. That’s 112 total copies! Leave a comment below. Tell me why you want this book. Be creative. I really do read these comments and base my decisions on them. Fill out the special form. I have set up a separate contact form to make it convenient for you to provide your mailing address. Please do not put your shipping address in your comment. This will automatically disqualify you. Twitter a link to this post. You can do so automatically by clicking here. If you don’t have a Twitter account, you can use Facebook. Promise to read the book. You will be tempted to set it aside, like you and I have done with so many other good books. But this is a book that really will change everything for you—but only if you read it. Obviously, I can’t monitor whether you actually follow-through. I am just asking you to make a promise to yourself. And keep it. On Friday, January 29, 2010, I will select 112 people, based solely on my arbitrary and subjective evaluation of their comments. If you are one of those selected, Lindsey Nobles on my team will notify you via email. If you don’t hear from her, you can assume you didn’t make the cut.